Since April is National Poetry Month, I thought I would mention a few recent favorites of mine in the poetry genre. This book manages to be child-like, playful, and literary all at the same time. 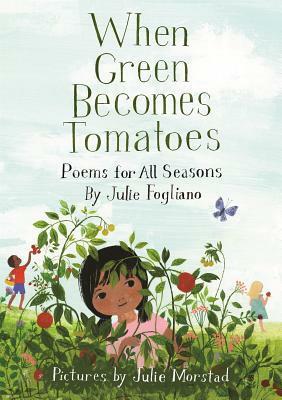 Fogliano's poetry reminds me a great deal of William Carlos Williams' simple, observational style. And Julie Morstad is quickly becoming one of my favorite illustrators. An all-around winner of a poetry book. This is definitely one I am going to need to own. I love picture books, poetry, and food. So when you put those three things in one book, I'm pretty sure to love it. 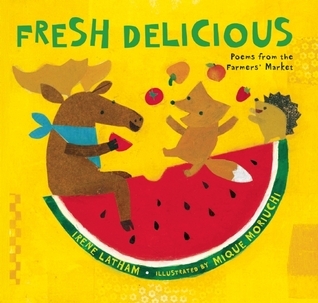 The poems in this book have beautiful imagery and are sure to make you hungry. The sweet, vibrant illustrations of anthropomorphized animal characters help bring a childlike wonder to foods (fruits and veggies) that kids might normally turn their noses at. In the author's note at the end, Roxanne Orgill mentions that she hopes readers will hear the sounds of jazz music as they're reading the poems. That's exactly what I heard as I was reading this book. 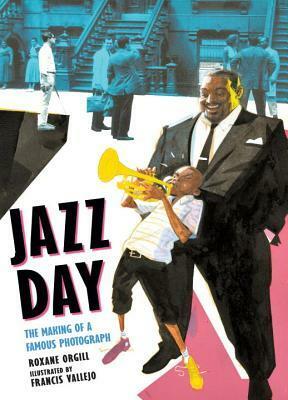 Since all of the poems tell a story, Jazz Day has that novel-in-verse feel to it even though it's a short picture book. And despite the fact that this is a picture book, I tend to think it's more for older readers since there's a great deal of background knowledge you must possess to fully reap the benefits of this fantastic narrative. This isn't necessarily a book young readers would pick up on their own. It's one that needs some nudging, but for readers who gobble up Kwame Alexander's novels-in-verse and love the hip-hop vibe and the obscure jazz references therein, Jazz Day might be a natural fit for the teacher or librarian who can hand sell it to the right kid.